On October 12, local police noticed a suspicious car on National Highway 1A in Le Thuy district of the province. When police asked the occupants to stop the car, they fled into a nearby forest. When examining the vehicle, police discovered 300 nylon bags of crystal meth weighing 308.6kg. The next morning, with the cooperation of local people, authorised forces arrested Xeng Vang, born in 1995 and residing in Bolikhamsai province of Laos, who was the car’s driver. He admitted he was hired to smuggle the drugs to Da Nang city for 10,000 USD. Local police are searching for other suspects. 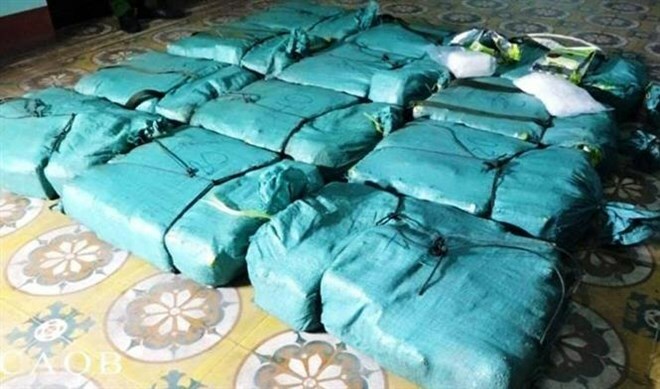 A day earlier, police in Nghe An province, also in the central part of Vietnam, arrested two drug traffickers, seizing 30 bricks of heroin, each weighing 350g. Those arrested include Nguyen Ngoc Ich, born in 1977, and Tran Dinh Hoi, born in 1984, both from Hanh Lam commune, Thanh Chuong district. The police said the suspectshave been under surveillance for a long time. On the morning of October 15, they were caught red-handed while attempting to transport the drugs from Thanh Chuong to Nam Dan district. 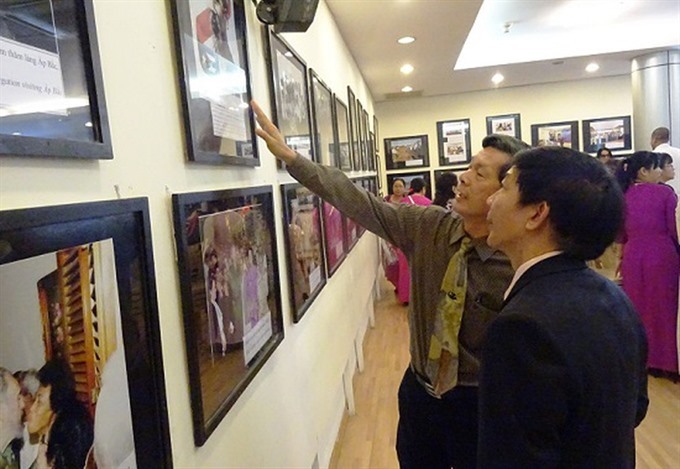 Visitors at the photo exhibition called “Friendship and Solidarity between Việt Nam and Cuba” at HCM City Women Cultural House. A photo exhibition featuring the long-term friendship of Việt Nam and Cuba opened on October 15 at the HCM City’s Women Cultural House. 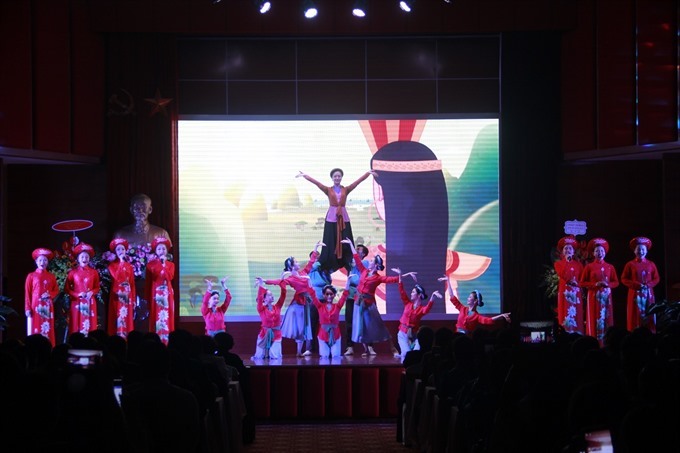 The event’s theme is “Friendship and Solidarity between Việt Nam and Cuba”. The exhibit displays 68 black-and-white and colour photos of the countries’ leaders over the trips. Highlighted works capture cultural and sports activities, landscapes, and people’s daily life in the two countries. Images of the late President Hồ Chí Minh and late President Fidel Castro are also included. The event is organised by the HCM City Union of Friendship Organisations and HCM City Women’s Association in co-operation with the Consulate General of the Republic of Cuba. It will close on October 30 at 192-194 Lý Chính Thắng Street in District 3. 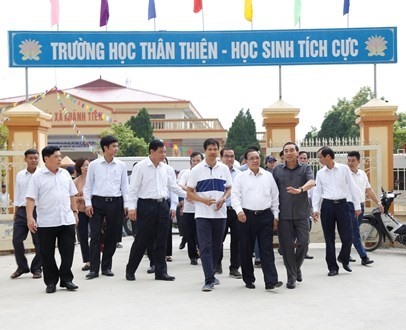 A delegation of ASEAN agricultural ministers, led by Vietnamese Minister of Agriculture and Rural Development Nguyễn Xuân Cường, visited the northern province of Ninh Bình on the weekend. The visit on Saturday was a part of the 40th Meeting of the ASEAN Ministers on Agriculture and Forestry (40th AMAF), held in Hà Nội last week. The delegation visited a new-style rural area in Khánh Tiên Commune, Yên Khánh District. The commune is one area in the district that has successfully implemented land consolidation, improving its infrastructure and restructuring the agricultural economy. 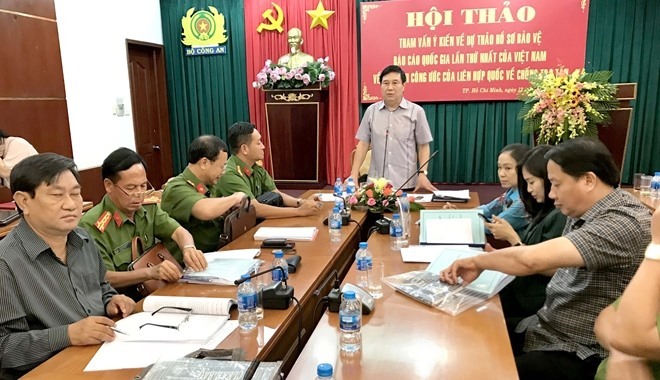 Deputy Secretary of the provincial Party Committee Đinh Văn Điến said the district was expected to finish its target of meeting national standards on new-style rural areas by the end of the year. 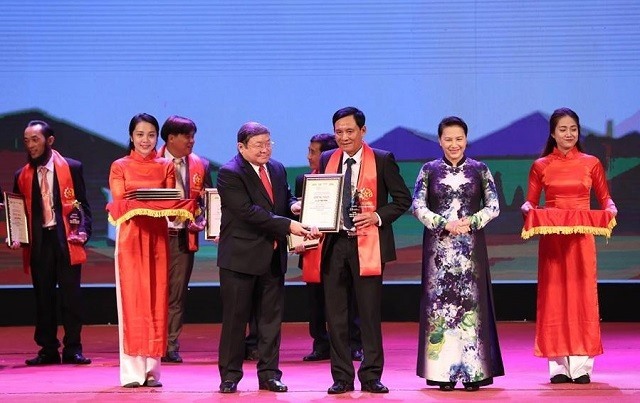 The province now has Hoa Lư District and Tam Điệp City being recognised as meeting such standards – one of the most successful in the country, according to Điến. The delegation also paid a visit to Đồng Giao Foodstuff Export Joint Stock Company – specialising in processing farm produce, to hear the head of the company speak about its current business activities and experiences in developing its raw materials. The company’s products have entered 40 countries and territories worldwide, including the United States, EU, Japan and South Korea. The company has developed raw material areas in both northern and central regions with major farm produce such as passion fruit, pineapple, sweet corn, mango, longan and vegetables. The Việt Nam Farmers’ Union (VFA) on Sunday honoured 63 outstanding farmers of 2018 in a ceremony in Hà Nội. The ceremony aimed to confirm and enhance the role and position of farmers in the process of building and protecting the nation, and their contribution during the country’s different periods of development. It was also hoped that the ceremony would help discover and expand examples of outstanding farmers who have made excellent initiatives and technological innovations which could be applied widely and effectively. It is the sixth year the ceremony has been organised. The 63 farmers, five of them are female, come from different fields such as planting, breeding, farming and seafood breeding. The outstanding farmers were chosen based on four criteria, including achievements in manufacturing and trading agricultural products, setting up new rural living lifestyle, and protecting the nation’s security and sovereignty and their scientific initiatives which can be applied widely and effectively in agriculture. Speaking at the ceremony, chairman of the VFA Thào Xuân Sùng said that "Farmers play an important role in the country’s development, from mountainous to plain areas, from rural to suburban, from inland to border and island areas. The work of setting up new rural living lifestyles would also be stronger and more effective, he said. Traffic piles up on Nguyễn Cơ Thạch Street on Monday morning. Thủ Thiêm Tunnel in HCM City has been reopened to traffic following a temporary closure earlier on Monday morning. The tunnel was shut after a truck carrying oranges crashed into scaffolding near the entrance to the tunnel in District 2. The incident caused the scaffolding to collapse and a motorcyclist was thrown from his vehicle. The rider was taken to hospital for emergency treatment. Police are currently searching for the driver of the truck, who fled the scene after the incident. 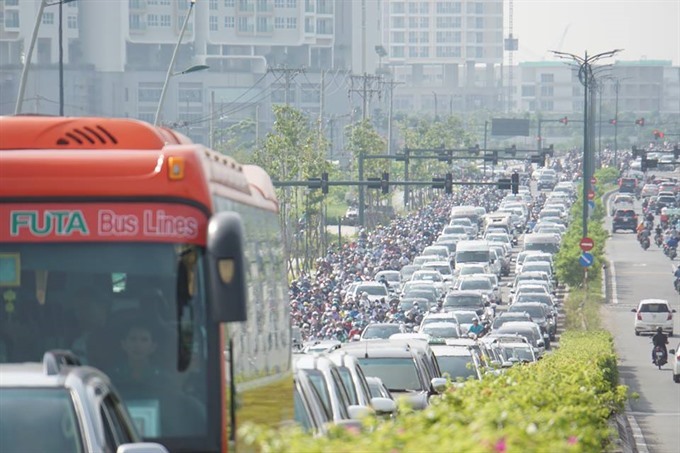 The accident caused traffic to grind to a halt for hours in surrounding areas, including on Nguyễn Cơ Thạch Street, Thủ Thiêm Bridge and Nguyễn Hữu Cảnh Street. The tunnel, running under the Sài Gòn River in HCM City, is 1.49km long, 33m wide and 9m high. It has six lanes which can carry around 45,000 automobiles and 15,000 motorcycles daily. The tunnel links the new urban area of Thủ Thiêm in District 2 with downtown HCM City in District 1. 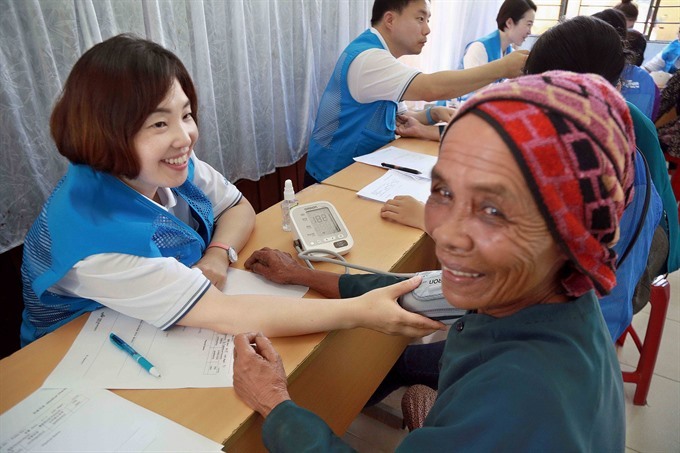 A doctor from Chung Ang University (CAU)’s Hospital of the Republic of Korea gives free medical check-ups for local residents in Quảng Ngãi Province. More than 21,000 people in the province have received free medicine and health services following a 10-year medical programme by the University and Doosan Vina. Chung Ang University (CAU)’s Hospital in collaboration with Doosan Vina Heavy Industry (DoosanVina) of the Republic of Korea donated medical equipment worth US$56,000 to Quảng Ngãi Pediatrics and Obstetrics Hospital at a ceremony on Monday. The donation also marked the 10th anniversary of the charity medical service programme in which CAU and DoosanVina have co-operated in providing free examinations and medicine to local residents in the central province. A volunteer medical team from CAU’s hospital and Doosan Vina also paid for medical check-ups and medicine for 2,300 poor people in Bình Sơn and Nghĩa Hành districts to mark the anniversary. Also on the occasion, the Ministry of Health and the provincial People’s Committee presented certificates of merit to representatives of the donors for their charity contributions to the community over the past 10 years. Annually, Korean doctors from CAU’s hospital system joined a free programme to supply needed medicines, diagnoses and treatment for residents in rural and remote villages in the province. South Korean professors and students from Chung Ang University also participate in a Corporate Society Responsibility (CSR) programme for primary school students and children with disabilities every year. A music performance in the Women’s Start-up Festival 2018, the first of its kind in the country. Twenty outstanding projects from across the country took part in the Women’s Start-up Festival which ended yesterday in Hà Nội. The four-day festival, the first of its kind, was organised by the Vietnam Women’s Union (VWU) and included projects in various fields such as education, tourism, agriculture, forestry and handicrafts. The 20 projects were selected from a list of 130. Politburo member and permanent member of the Secretariat Trần Quốc Vượng said that the projects expressed women’s passion for innovation and developing their trades in different fields and areas. Lê Thị Lệ Phương, director of Gia An Company which processes products made from tomatoes, eggs and milk in the Central Highland province of Lâm Đồng, was one of the women who took part in the event. Phương said that Đơn Dương District in Lâm Đồng Province produced 30,000 tonnes of tomatoes per year, but did not have a plant to process them and supply far outreached local demand. “I came up with an idea to process products made from tomatoes, eggs, molasses and milk, and now they bring in an income 10 times higher than raw tomatoes,” said Phương. Đỗ Thị Nhị, head of the Bình Minh Private Kindergarten in the northern province of Bắc Ninh, was also chosen for the event. She runs a private kindergarten for handicapped children in the province. “I give priority to the children of workers from industrial zones in the province and neighbouring areas because I want to share their difficulties,” said Nhị. 200 children have enrolled at the kindergarten, and are now learning to speak and integrate into the community. Also yesterday, five organisations and 10 women were honoured with the Việt Nam Women’s Prize. The award was founded in 2002, and 74 organisations and 134 women have received the prize. The prize aims to encourage creativity, determination and energy. It also certifies women’s devotion, talents and innovation in the process of building and protecting the nation. Crossing the roads in Hà Nội is like something out of Mad Max — every man for himself and no prisoners taken — so it’s no surprise locals have started arming themselves for their trips to the shops. On Trường Chinh Road of Thanh Xuân District, an elderly man holding a bicycle was recently seen walking across a crowded street. He held his bicycle, blew his whistle and waved a cane to get drivers out of his way, which may seem like enough to cross a street with, but he clearly felt it was better to be safe than sorry. A few steps into his journey, he took out a large, sharp meat cleaver from the basket of his bike and began brandishing it at incoming traffic. A video of the incident quickly spread across social networks, with most of the thousands of viewers stunned by the man’s actions. Many people expressed concerns about the danger he put those around him in. “The method is extremely bold and unique, ensuring no vehicle dares to block the road. However, it is clear that such waving should not be done. You shouldn’t repeat this method,” one Facebook user commented. Whether you agree or disagree with what this man did, if you’ve ever used the roads in Hà Nội, you’ll partly understand his desire to arm himself to the teeth. Many parts of the Đà Nẵng-Quảng Ngãi Expressway in central Việt Nam developed potholes. Repairs meant to fill in potholes and fix other problems on a key expressway in central Việt Nam have been slammed as lacklustre patchworks. The 140km four-lane Đà Nẵng-Quảng Ngãi project, built over five years with a total cost of VNĐ 34.5 trillion (US$1.47 billion), was opened to traffic in early September. A short time afterwards, reports of potholes, asphalt peeling and waterlogging, especially on the Đà Nẵng-Tam Kỳ (Quảng Nam) stretch, quickly emerged. The investor’s haphazard fixes did little to improve the situation and complaints of defects kept mounting until the transport ministry had to step in early October and demanded correction measures. The main investor, State-run Việt Nam Expressway Corporation (VEC), told the transport ministry on October 11 that the road had been completely mended and blamed the problems on inclement weather. However, the concrete and asphalt mixture used to patch the potholes disintegrated and could easily be removed by hand, leaving rainwater-filled holes on the road, according to Vietnam News Agency. Construction workers were also filmed by Vietnam News Agency using only hand tools, without any specialised machinery, to repair the potholes, again raising doubts over the investor and contractor’s resolve to address the persistent issues. Trần Văn Tám, director-general of VEC, said there were about 15 similar defects on the Đà Nẵng-Tam Kỳ section. With the pothole’s radius averaging 20cm, the total area of defects on the section came to 70sq.m out of 3.1million sq.m, the total road surface. VEC claimed that prolonged rain made it impossible to carry out “two-step treatment” that delivers more permanent results than the temporary solution they had used to ensure safe traffic along the expressway that allows for speeds up to 120km/h. The company said thorough repairs would only take one to two days “under optimal conditions” and pledged to finish the work before October 17 at the earliest. 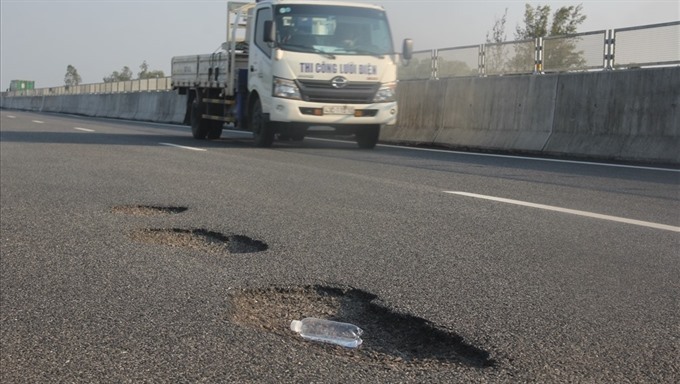 VEC said since it’s still in the warranty period, the Vietnamese contractors would assume responsibility for the road defects and bear the full costs of maintenance. During October 13’s surprise inspection of the Đà Nẵng-Tam Kỳ section that was built with Japanese official development aid under the consultancy of a Japanese-Australian venture, deputy minister Lê Đình Thọ said “the expressway indeed has issues” given how the road just went into operation for a month. “The transport ministry can attest to the general quality of the project. The issue here, however, is that the way the investor and the expressway management board dealt with the road defects was untimely, irresponsible and not consistent with the transport ministry’s directions, which ultimately drew public ire,” Thọ said, demanding that the road quality should not be affected whether it shines or rains. Previously, transport minister Nguyễn Văn Thể issued a decision demanding a halt on toll collection on the whole expressway from October 12 until the defects are corrected. The ministry would only allow toll collection to resume once it’s satisfied with the repairs. Earlier today, transport minister Thể signed another document, harshly criticising VEC’s negligence and inadequate repair works. “The contractor must mobilise all necessary specialised machinery, equipment and materials; arrange for barriers and guards and direct the traffic to ensure the safety of the maintenance workers and of the drivers,” the document said. In a related issue, responding to concerns over Chinese contractors’ works on the Tam Kỳ-Quảng Ngãi section using World Bank funds, deputy minister Thọ said Jiangsu company was awarded the contract as they were the lowest bidder in open international bidding. “The construction works followed regulations and guidelines, under the stringent supervision of independent watchdogs,” he said. He also dismissed the allegation that mud, instead of concrete, was used to make the roadbed. “The project involves foreign and independent consultants, if the materials are sub-par, the contractor would be asked to redo the whole road section in the final review,” Thọ said. The Mekong Delta province of Hậu Giang has achieved sustainable poverty reduction through proactive measures like providing soft loans and training in vocational skills for the poor. Nguyễn Hoàng Anh of Vị Thủy District’s Vĩnh Trung Commune, who used to be poor, said local authorities helped him borrow VNĐ30 million (US$1,280) to raise oxen and district agricultural officials taught him how to tend them. He has 10 oxen and cows now and repaid the loan, he said. To help eradicate poverty, the province has classified poor people into two categories – those who lack the resources to carry on business or production activities and those not willing to work hard. Based on the reason for each person’s poverty, the province then offered support measures to help them. In the case of those who lack the money to do business, authorities are working with the Bank for Social Policy to provide them with soft loans and instruct them in doing business. In the case of slackers, the province has created a model under which officials persuade them to become self-reliant. They also explain to them the province’s support policies to help people like them. Besides, talking to them helps authorities clearly understand the difficulties poor households face. Hồ Thu Ánh, director of the province’s Department of Labour, Invalids and Social Affairs, said this model was instituted in 2016 and achieved excellent results. The province has also adopted several policies to support poor ethnic households, especially Khmer. Since 2013 the province has provided them with soft loans worth a total of VNĐ1.7 billion ($73,000) for carrying on business or production and spent more than VNĐ4.8 billion ($205,000) on giving them farming and housing lands and providing vocational training and jobs. In Ngã Bảy Town, authorities have taken many effective measures to help poor households escape poverty sustainably and lead stable lives. 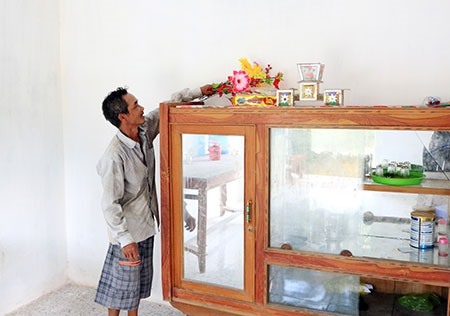 Nguyễn Văn Lâm of the town’s Đại Thành Commune, whose family is poor, said local authorities provided him a grant of VNĐ50 million ($2,100) to rebuild his dilapidated house. Dương Văn Giang, chairman of the Đại Thành People’s Committee, said the commune has 80 poor households, or 2.7 per cent of the total number. The administration hopes to lift 21 of the 80 out of poverty this year, he said. Reducing the poverty rate is one of important criteria for localities to achieve the new-style rural area standards, she said. The poverty rate in the province reduced from 12.5 per cent to 9.6 per cent during the course of last year, according to official statistics. The report was submitted to the UN Committee Against Torture last July, providing a comprehensive overview of the results achieved by Việt Nam in preventing and punishing torture-related acts, and clarifying the main measures it is taking in terms of policies and laws. “The first report also emphasises the main shortcomings and challenges for Việt Nam and defines priorities for the future,” said Lieutenant General Nguyễn Ngọc Anh, Director General of the Ministry of Public Security’s Department of Law and Administrative Judical Reform, at a workshop held yesterday in Hà Nội in preparation for the review. Việt Nam ratified the convention in 2014 and it started to take effective in 2015. “The ratification of the convention has a significant meaning in protecting human rights and implementing the humanitarian policies of the Party and State of Việt Nam, contributing to implementing the country’s 2013 Constitution,” he said. The Vietnamese delegation will present the report to the UN Committee on November 14-15 in Geneva. The national report reflected Việt Nam’s efforts to implement its obligations as a member of the convention, Anh said. Once a State ratified the convention, it had to report on a periodic basis of the implementation of the convention within one year of ratification and then every four years. This was designed to help member countries assess and improve the convention’s implementation, according to Catherine Phương, Assistant Country Director, Governance and Participation, UNDP Việt Nam. “During the two sessions of three hours of review, Việt Nam will present the report and then provide responses to questions raised by the UN Committee members. The review is not an end in itself. It is an opportunity to reflect on areas where further improvement can be made and where further support might be needed,” she said. Addressing the event, UNDP Country Director in Việt Nam Caitlin Wiesen stressed that Việt Nam had an impressive record when it came to ratification of international human rights treaties and was now a party to seven of the nine core treaties. “Over the last few years, we have already seen some of the impact of the ratification of the Convention against Torture by Việt Nam. The Ministry of Public Security has engaged in a number of activities to train law enforcement officers on the convention. Additionally, police officers have received more training sessions on improved interviewing and investigating skills as a means to prevent torture and ill-treatment,” she said. During the workshop, participants discussed in more detail how the review of the report would take place and how to prepare for it. A mock session was held later the same day to help the Vietnamese delegation prepare for the upcoming review in Geneva. The Convention Against Torture was adopted by the UN General Assembly in 1984. It had been ratified or acceded by 164 States as of last December. Prime Minister Nguyễn Xuân Phúc has approved three projects to build new facilities at three regional general hospitals in HCM City to meet increasing demand for health examination and treatment. Total capital for the Thủ Đức, Hóc Môn and Củ Chi regional general hospitals is estimated to be more than 5.6 trillion (US$240 million) from the city’s budget. Construction on the 1,000-bed hospitals, which will have 500 beds each for inpatients, will begin this year and finish by 2023. The modern, high-quality hospitals, which meet ASEAN standards, will be outfitted with the latest medical equipment and facilities to provide patients in surrounding areas. The director of the Health Department, Nguyễn Tấn Bỉnh, told Sài Gòn Giải Phóng (Liberated Sài Gòn) that the hospitals were one of the department’s six key projects until 2030. The hospitals will help reduce patient overcrowding at large national and city-level hospitals. The city’s gateway areas were chosen to serve patients in outlying and neighbouring areas. The projects will be submitted to the city People’s Council by October 31 for capital allocation next year. 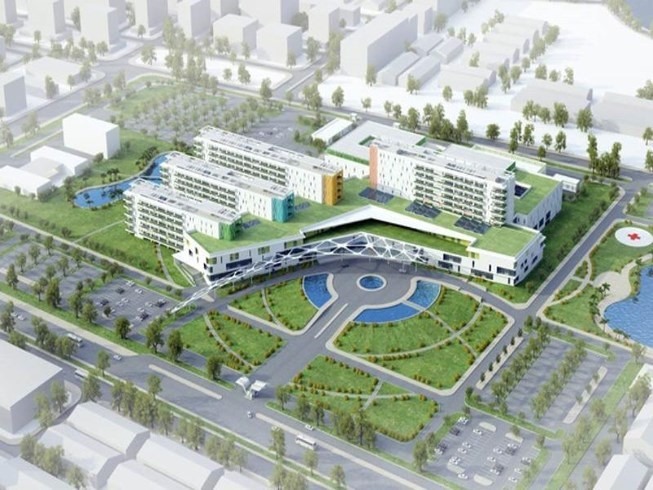 Construction on Củ Chi Regional General Hospital will start first, followed by Hóc Môn Regional General Hospital and then Thủ Đức Regional General Hospital. The department has increased enrollment quotas for Phạm Ngọc Thạch University of Medicine since 2008 so that enough staff can be hired for hospitals, district health centres, and commune and ward health stations. More than 600 doctors who will graduate this year will work at these hospitals when they open, according to Bỉnh. Doctor at city-level hospitals are sent temporarily to district-level hospitals to work six months to one year and help with training. For many years, the city People’s Committee has allocated funds to upgrade and build new facilities for grassroots-level health centres and stations, and hospitals in the city. New facilities at several hospitals such as Cần Giờ District Hospital and District 12 Hospital will open next year. Construction of new facilities at other hospitals including Nhà Bè District Hospital and District 2 Hospital is also expected at a later date. District hospitals in recent years have helped reduce patient overcrowding at national and city-level hospitals in the city. The doctors at district hospitals are capable of treating common diseases and offering sophisticated health care services.